What versions of OS X is Camouflage compatible with? Why can I see the icons when I use Desktop-Exposé in OS X 10.7 and newer? The icons are hidden in 10.6! The way Spaces works in 10.7 and above changed significantly compared to 10.6. 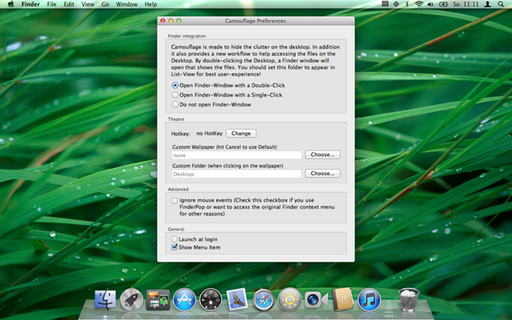 To make Camouflage work in 10.7 properly this feature had to be removed. Why do the icons appear when I switch Spaces? Same as the previous answer. Spaces changed and that was the only way of getting Camouflage to behave. Why do I see no response to my Reviews in the Mac App Store? Currently Apple doesn't provide a way to respond or react to Reviews. If you want to communicate with other users, post a review. If you want to communicate with the developer, please send me a mail! My Menubar is full, what can I do to access Camouflage? 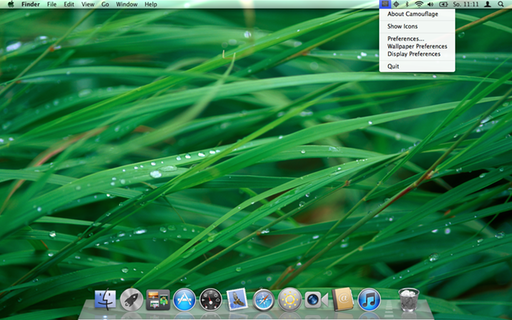 First you can switch to an application like Finder, which has a shorter menu than Safari. Maybe Camouflage's Menu Item is not hidden then. 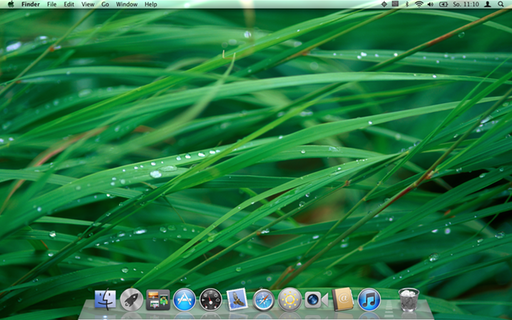 You can also drag Camouflage from your Applications Folder into the Dock. Once ther, you can click on Camouflage in the dock to show and hide your icons. The Camouflage Preferences also allow you to turn off the menu item completely. I disabled the menu item, how can I access Camouflage's preferences?